You don’t have to own binoculars and know a bunch of fancy Latin names to watch birds! No matter where you live, they’re in your neighborhood — just look up. In Look Up! : Bird-Watching in Your Own Backyard you get a conversational, humorous introduction to bird-watching encourages kids to get outdoors with a sketchbook and really look around. Quirky full-color illustrations portray dozens of birds chatting about their distinctive characteristics, including color, shape, plumage, and beak and foot types, while tongue-in-cheek cartoons feature banter between birds, characters, and the reader ("Here I am, the noble spruce grouse. In a spruce grove. Eatin’ some spruce. Yep."). Interactive and enjoyable tips bring an age-old hobby to new life for the next generation of bird-watchers. 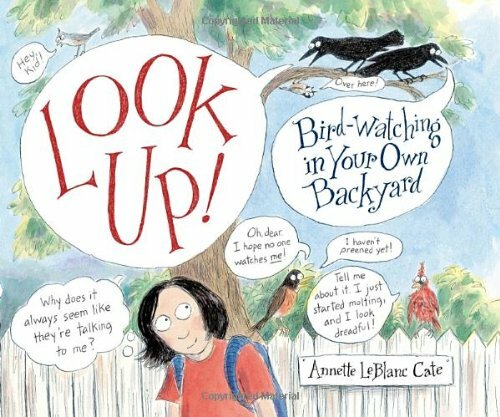 Annette LeBlanc Cate has written an informative and humorous book for children about bird watching. However after reading it, I felt any adult new to bird watching would gain valuable advice from her detailed book. Annette made it very clear that you do not need special equipment to watch birds, nor do you have to travel other than your own backyard either. She encourages children to use their eyes to observe, notebooks to draw, and of course her book to locate specific characteristics of birds. She included questions to assist children in their viewing: Does the brown bird have any special markings on its body? What kind of beak does it have? Annette includes pages showing: various bird beak shapes, silhouettes of birds, nest shapes and locations, and more information that is not only interesting but she makes it fun to read. She included drawings of many of the popular birds in different parts of our world. This complete book for children is the best one I have seen. If you have a child interested in nature and especially birds, I encourage you to locate a copy of Annette's book.